The East County Senior Service Providers will present their 12th annual Senior Health Fair at the Santee Trolley Square amphitheater and food court on Friday, May 20, 2011. The event begins at 10:00 a.m. and runs until 1:00 p.m. The Health Fair will provide a variety of screenings including stroke, blood pressure, diabetes, and depression. There will also be information on educational programs, community and home care services, housing options, and volunteer opportunities. Over 60 vendors will be on hand to share information about their services. In addition there will be raffle cards for all who attend – get the vendors to sign off on your card and turn it in for drawings for prizes. The Senior Health Fair is sponsored by the East County Senior Service Providers and by Grossmont Hospital, the Grossmont Healthcare District, and Santee Trolley Square. For information about attending the event, you can contact La Mesa Adult Enrichment Center at 619-667-1322. If you are a vendor interested in setting up an information table, contact Laura Printy from the Alzheimer’s Association at 858-966-3291. 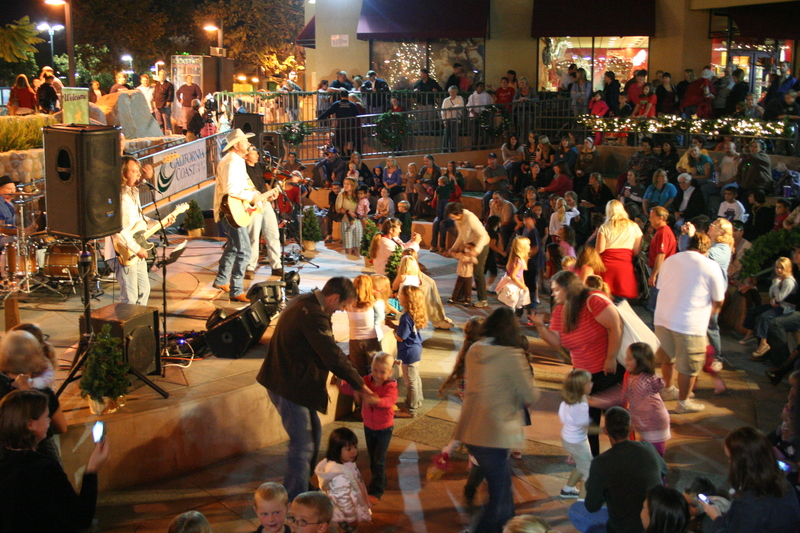 Santee Trolley Square is located at the eastern terminus of the San Diego Trolley Green Line, at 9850 Mission Gorge Rd. 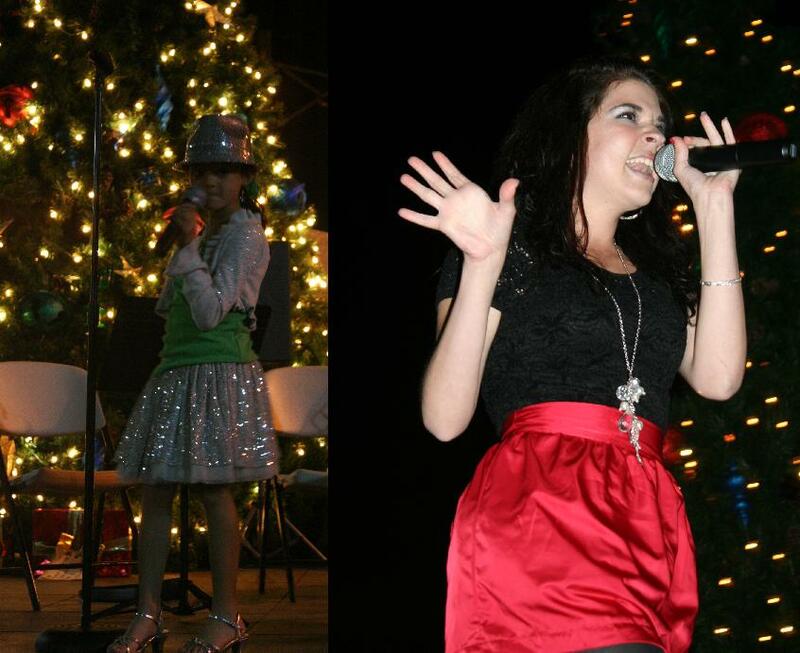 Thursday afternoon, December 17, the Lakeside Middle School Show Choir will perform at the Trolley Square amphitheater, starting at 4:00 pm. Now, I admit that I am a bit partial, since my daughter and several of her friends are in the group, but this Choir is one of the best I’ve heard. If you haven’t gotten into the holiday spirit yet, these kids are sure to put you over the top. They will be joined by the Lakeside Farms Elementary School Choir – another great-sounding group of kids. Come out, have some fun, and support the Arts in East County. 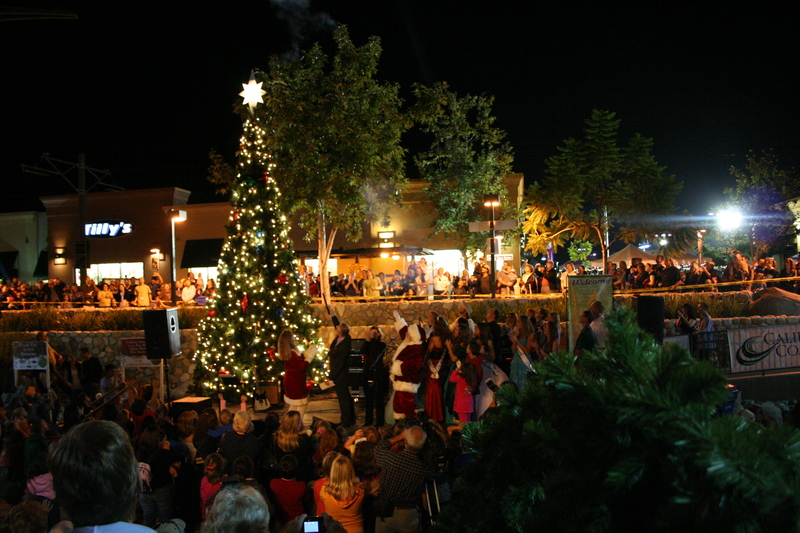 The holiday season officially came to Santee on Friday, November 20, when the annual Holiday Lighting Celebration took place at Santee Trolley Square. 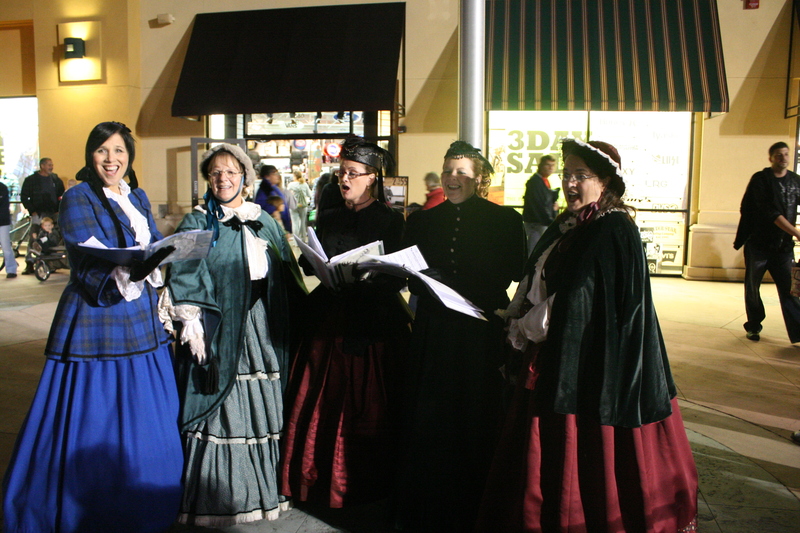 Put on by the City of Santee and sponsored by Waste Management, Santee Trolley Square, Daphne’s Greek Cafe, and Fireworks America, the event brought a jolt of spirit to help start the season. 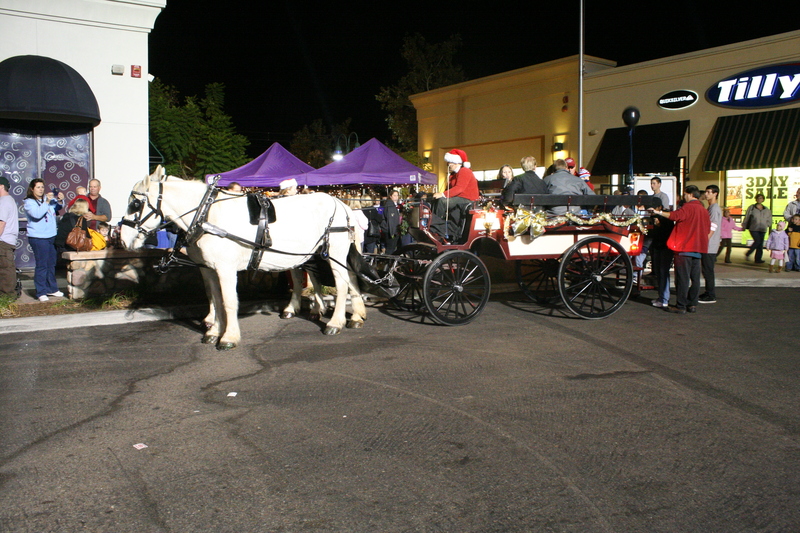 Other participants this year included Target, Lowe’s, and the Santana High School cheerleaders. 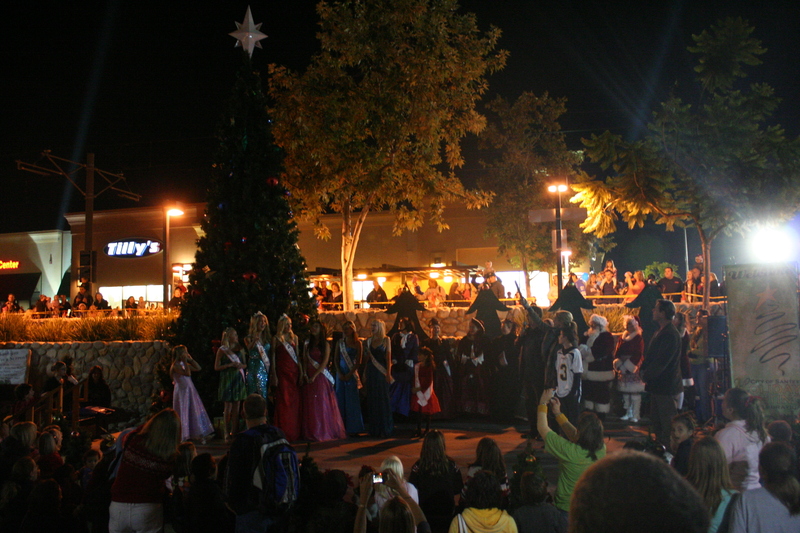 Also on hand were Miss Santee and Miss Teen Santee with their court, and Santa and Mrs. Claus. I noticed that this year, whether because of the economy or other reasons, the Celebration was smaller than the previous year’s. 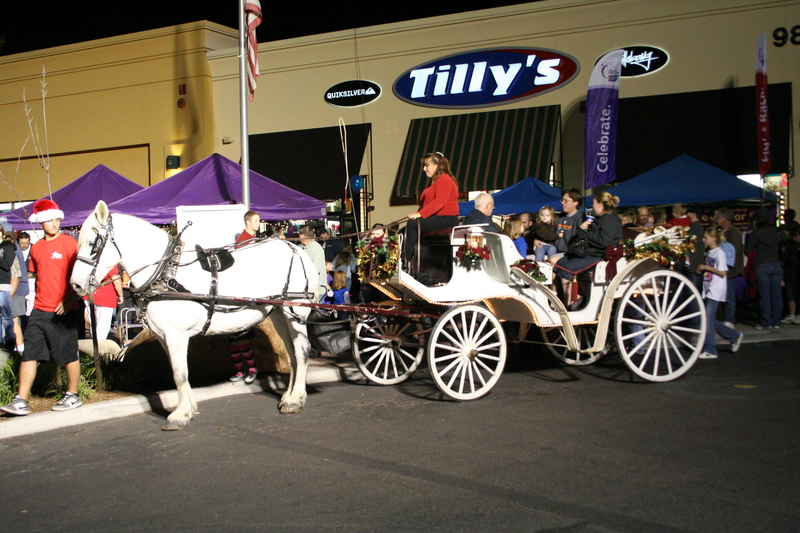 There was still the music, the lighting of the tree, the iceless skating rink, and the carriage rides, but little more. Gone were the booths that filled the parking lot in front of the amphitheater last year. And the musical entertainment was also toned down, though still festive. Singing Solo, a local program that provides kids age 6-18 the opportunity to sing in public, provided the pre-lighting music as well as covering for the main music group during their breaks. 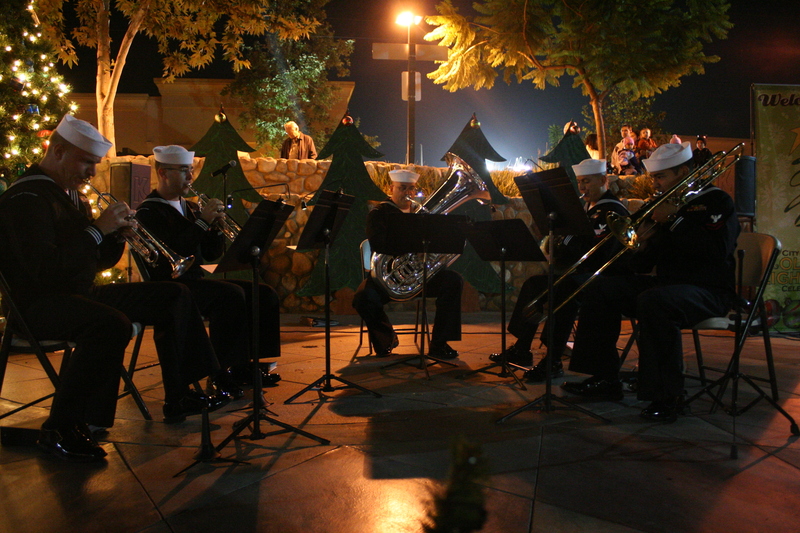 The Singing Solo artists ranged from six-year-old Emily singing “You’re a Mean One, Mr. Grinch” to seventeen-year-old Kelsie doing a rocking version of “Santa on the Rooftop.” Also on the ticket for the evening was the U.S. Navy Band Southwest Brass Quintet with a selection of holiday music. 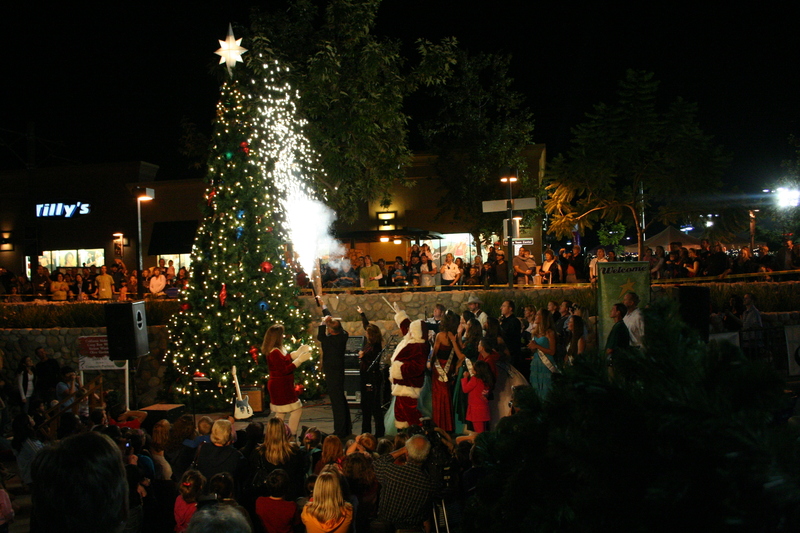 The highlight of the evening, of course, is always the lighting of the tree on the amphitheater stage. 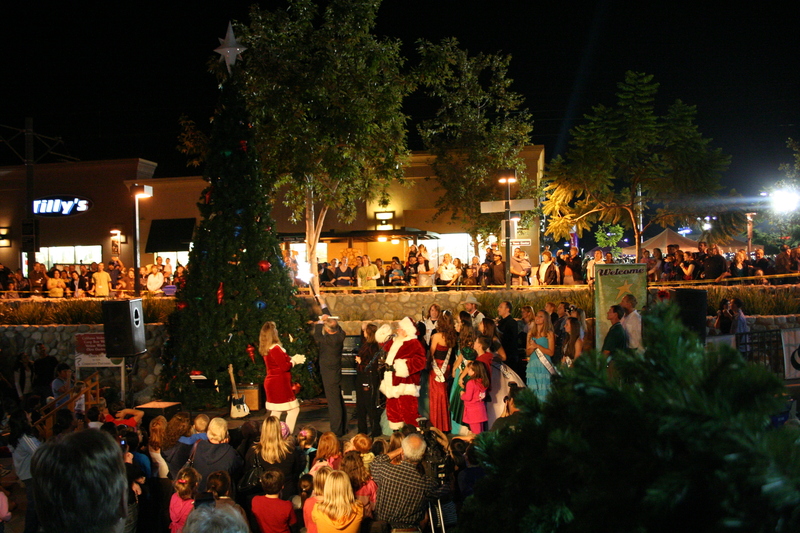 This year host and tree lighting duties were handled by Vice Mayor Brian Jones and his family, with help from the Clauses. 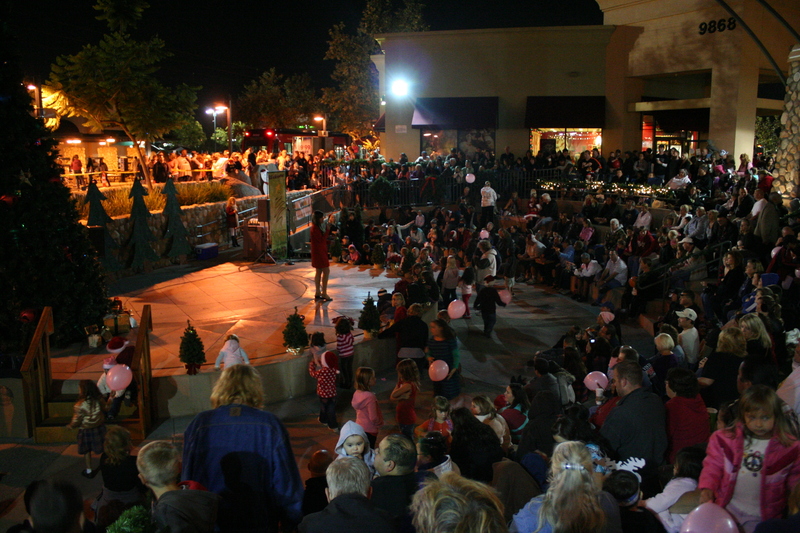 Also on hand for the lighting were representatives from the City, Waste Management, Trolley Square, and the Miss Santee court. The evening was fun, even though lower key than last year. But I do hope that this won’t be a trend for the future and that next year will have the community and business involvement missing this year. The Screamin’ Primas include husband and wife leads Guy and Lynette Gonzales, and a wailing brass section featuring Kevin Esposito on trombone, Mark Lessman on saxophone, and Steve Ebner on trumpet. Backing them up and laying down the beat are Tom Stilman on drums, Bill Shreeve on keyboard, and Roger Daschle on upright bass. Together they bring back that signature sound of the Prima era. The crowd, though not as large as for Cash’d Out, was just as enthusiastic, if not more so. The “Primas” had them literally dancing in the aisles – and the stairs, when Guy Gonzales and the brass section did a “walk around” during the group’s performance of “When the Saints Go Marching In.” It was a great evening of music presented by a wonderful group dedicated to bringing the music of Louis Prima to a new generation. This week Emerald River brings Country back to the Trolley Square amphitheater, starting at 6:30 pm on Thursday, August 6. 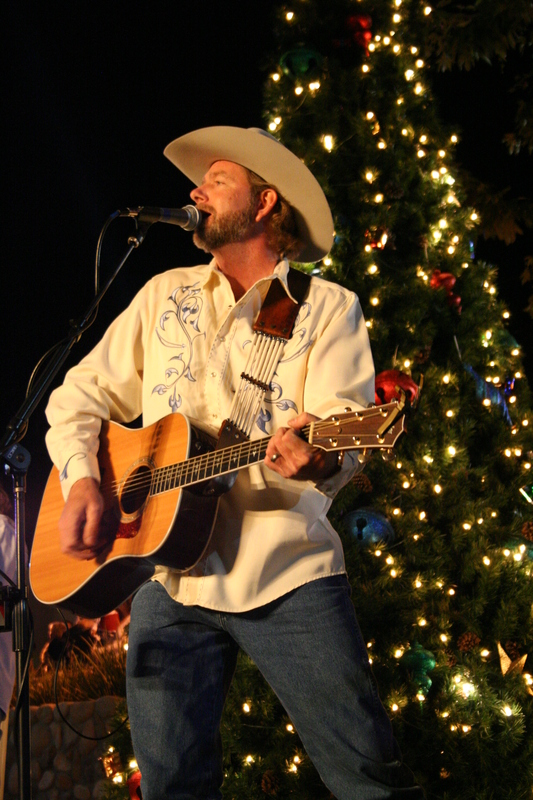 Last Thursday, July 9, the Santee Trolley Square amphitheater was jumping to the sounds of Southbound Jonny, “San Diego’s Most Wanted Country Band.” The crowd was large and raucous, the music was loud and intense, and this “rowdy country band” was at its finest. The group, fronted by John Watson on vocals and acoustic guitar, played a wide variety of music, from Brooks & Dunn to Bob Seger to a “drunken redneck” version of the Beatles “Things We Said Today.” Watson was joined by lead guitarist/vocalist Glenn Wolff, drummer/vocalist Dave Largent, bassist/vocalist Tom Carper, and violinist/mandolinist/vocalist Dave Edelman. 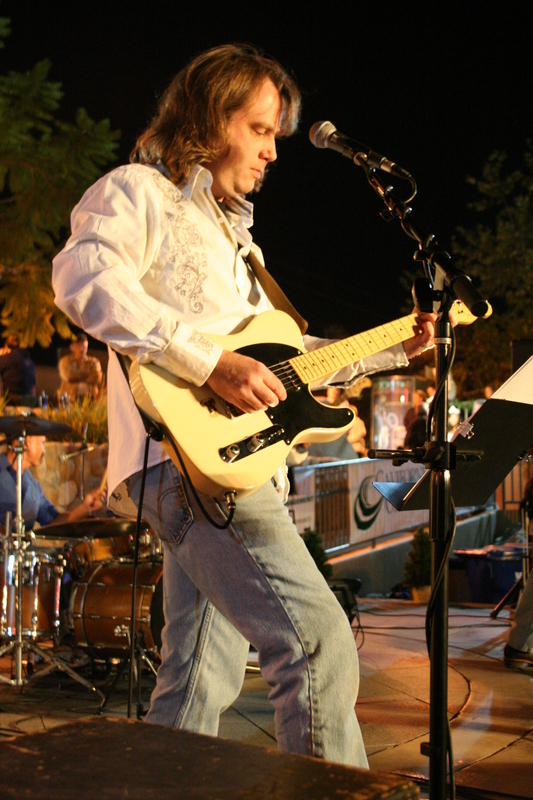 Watson, a Virginia native, came to the San Diego area in 1997 following a successful solo acoustic career in and around Washington, D.C., Virginia, and Maryland. The tall Virginian is a commanding presence on stage, but what really keeps the crowd’s attention is his personality – a little bit redneck, a little bit comic, and a whole lot of fun. If Watson is the focal point of the group, lead guitarist Wolff is the power pack. Another product of the VA-DC-MD region, the Baltimore native brought his high-energy guitar work to San Diego in 1991 and definitely puts the “rock” in country-rock. It was the pairing of Watson and Wolff that first created Southbound Jonny, and it’s easy to see the chemistry these two crazy musicians have together (see below). 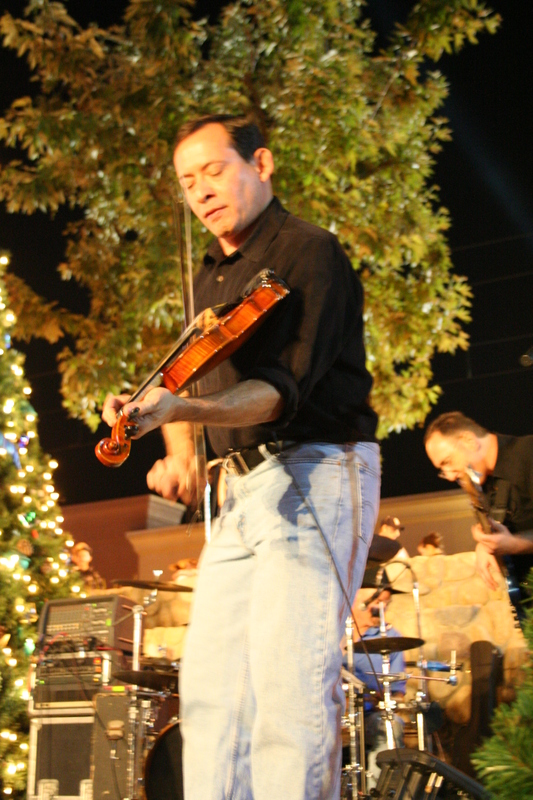 Perhaps the least “country” of the group is New Yorker Edelman, who grew up in view of Central Park and originally trained in classical violin. But one blast of his foot-stompin’ fiddling leaves no doubt that, if not country born he certainly has country in his soul. After the concert he talked about trying to do something about his “grimaces” while playing, but those just accentuate the fervor of his playing. His mandolin playing, while it doesn’t have the passion of his fiddle, was a great accent to several songs. Every good band needs that solid backbeat to keep the music running smoothly, no matter how crazy the front line might get. 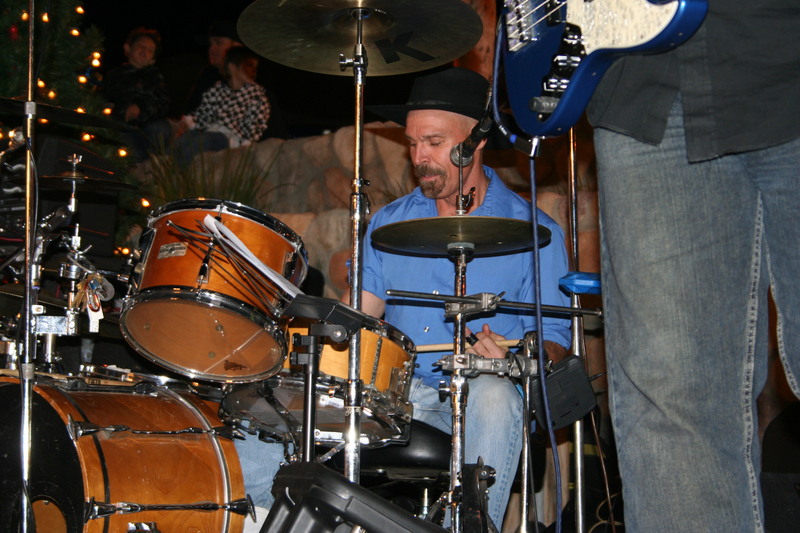 The rock of that beat is Miami-born drummer Largent, a talented singer and song writer in addition to his prowess on the kit. The second-most “local” of the group, he moved to San Diego as a boy and grew up to play opening act for the Beach Boys, Tom Johnson, and Dave Edmunds, among others. The group plays several of his songs in their performances. 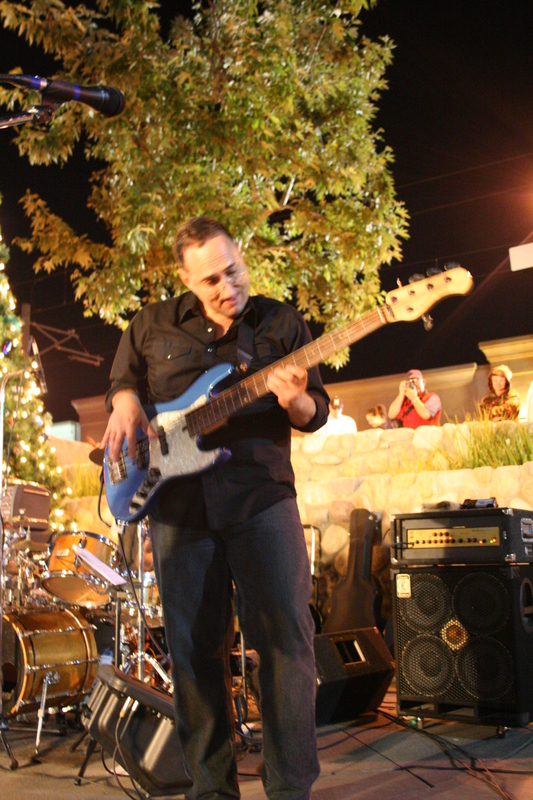 The second half of the backbeat is bassist and San Diego native Carper – a multi-talented musician who cut his musical teeth on the trumpet in high school and later went on to play bass with numerous country artists. While his on-stage presence is overshadowed by Watson, Wolff, and Edelman, his playing more than holds its own. As always, the dancing bug was biting full-force. Impromptu line dances were the norm, but partner and free-style had their place as well, as did circle dances with Miss Santee and her First Runner Up. The hit of the night, though, was one very young couple that had their moves down in spite of their age. Next week Spectrum brings its high-energy dance music to the Summer Concert Series. 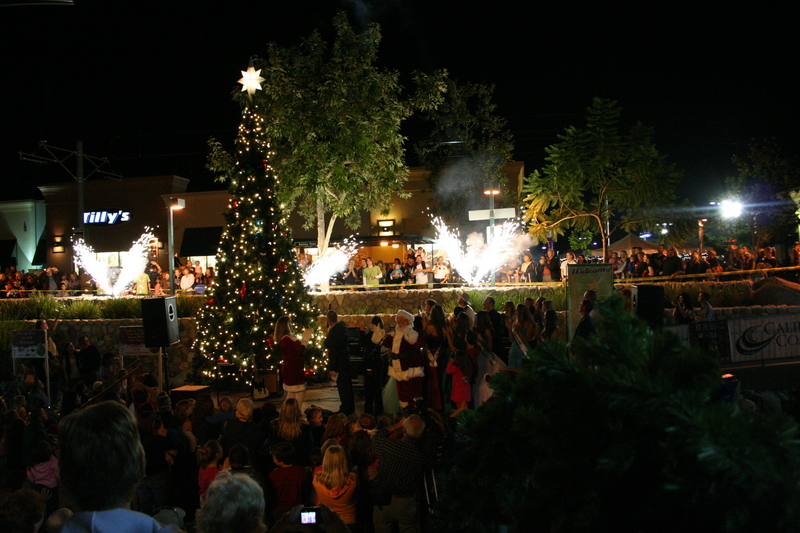 Yes, the Holiday Season has officially arrived in Santee. 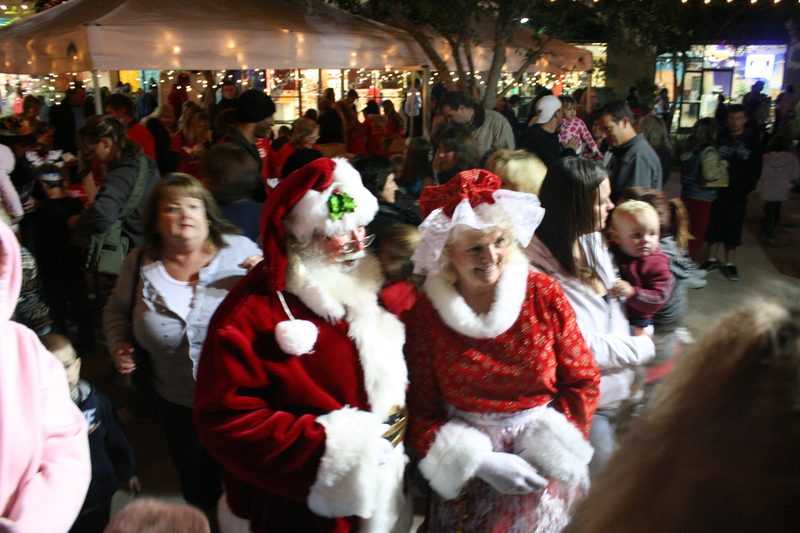 Friday night (November 21) was the Holiday Lighting Celebration at Santee Trolley Square, complete with Santa Claus, Princesses, music, food, and lots of fun. A very large crowd took part in the festivities, a welcome reminder that not all is gloom and doom as the news media seems to show these days. 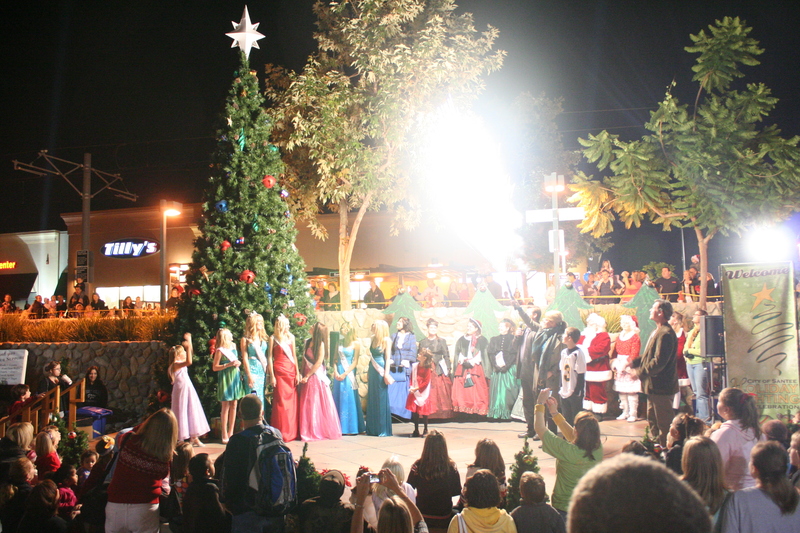 The activities centered around the amphitheater, where Santa Claus and Mayor Randy Voepel were joined by the Miss Santee and Miss Santee Teen princesses for the actual lighting. 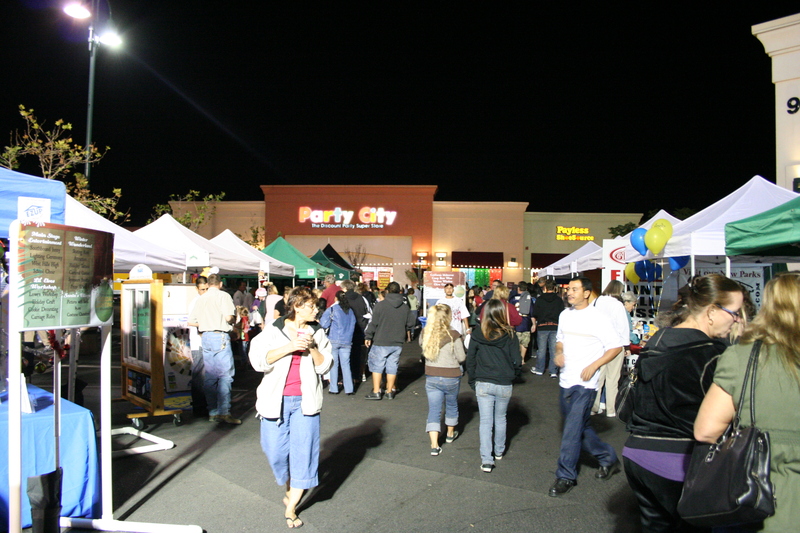 On the Target side were various community and business booths, including Camp Bow Wow, Waste Management, the Park and Recreation Department, Verizon, and KSON. Several of the booths had prize wheels to spin along with a variety of goodies and trinkets to win. 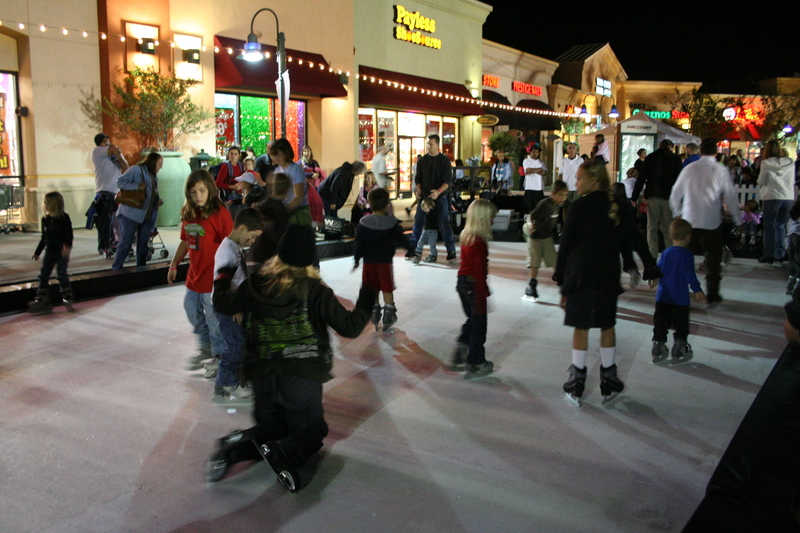 This year the celebration included an iceless skating rink made of waxed plastic resin panels. I didn’t try it out – not with my back – but the people who were out there seemed to be doing just fine and having a good time. 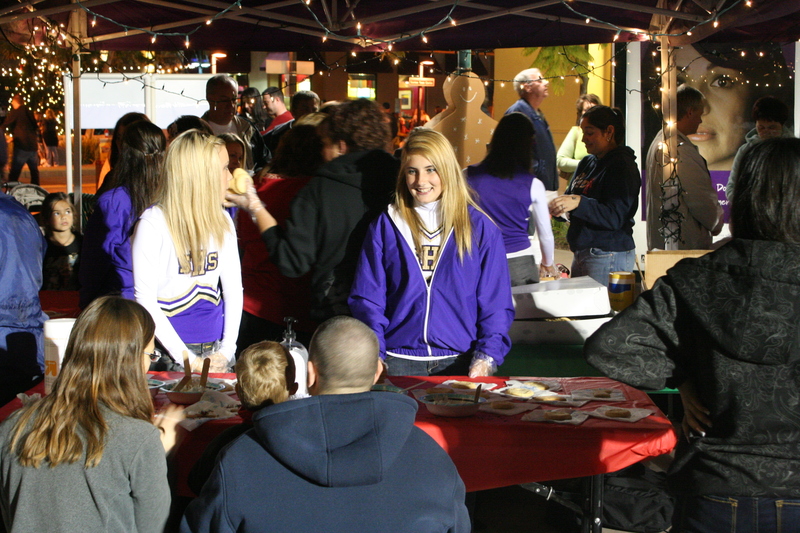 On the other side of the center were several craft and activity booths staffed by Lowe’s, Target, and the Santana Cheerleaders. 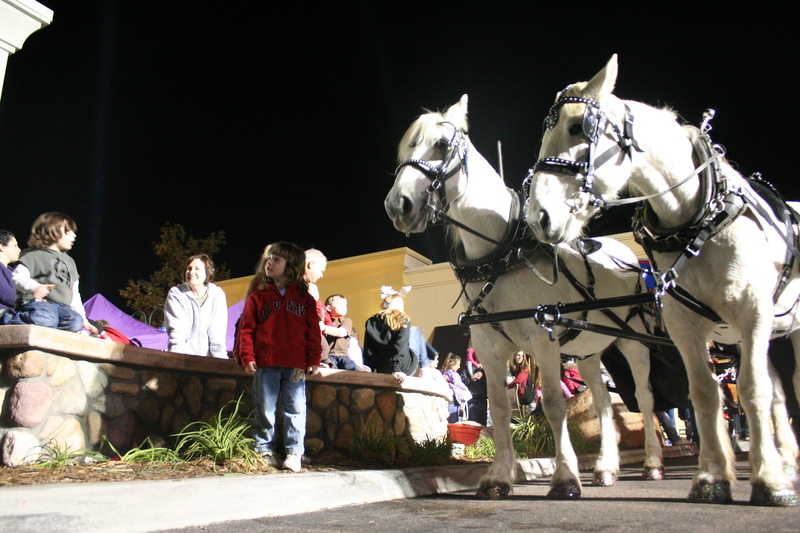 There were also carriage rides, which were very popular. 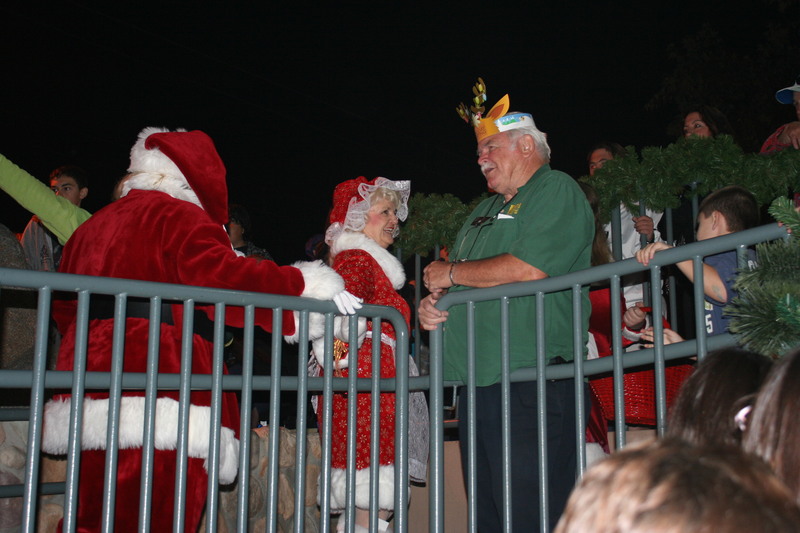 And of course, after his tree lighting duties Santa made time to meet the children who had come down. 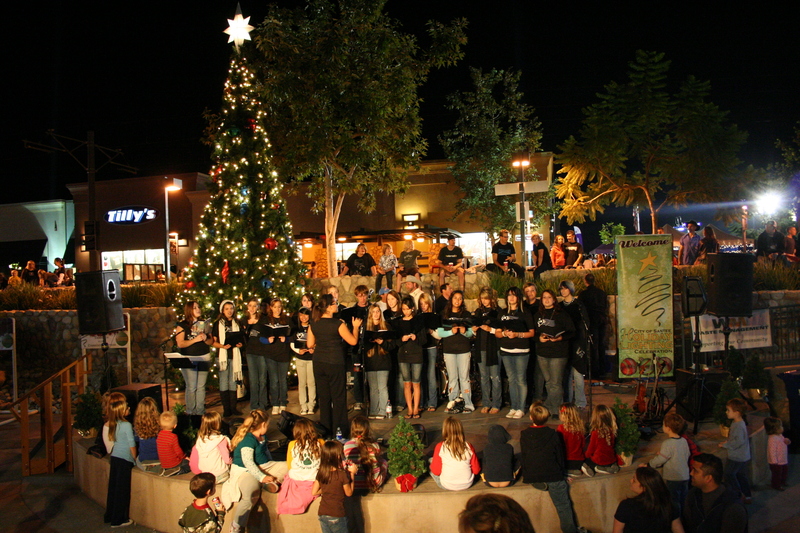 Entertainment in the amphitheater was provided by the country band Southbound Jonny and the West Hills High School Choir. Unfortunately the amplification wasn’t set up well for the choir, so it was difficult to hear this talented group of teens. But Southbound Jonny was definitely a big hit, and had people dancing and singing along. Thanks to all of the businesses and groups that donated time, talent, money, and more to make this a successful celebration.